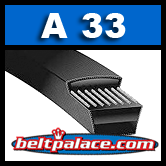 A33 Bando V-Belt replaces Ariens 07200007, 72000111, Dayco L435, Supco A-33, MTD 754-0101A and 954-0101A and more! A33 Bando V-Belt. Superior replacement v-belt for FHP and Generic V-belts. A33 Classical V-Belt. 1/2" (13mm) Wide, 35" (889mm) Length. RMA certified to resist heat, oil, and static. Heavy duty V-Belt for multiple uses: Snow Blower/Snow Throwers, Lawn & Garden, Fans-Blower Motors, Go Karts, Industrial Power Transmission. Suitable for all industrial applications, including v-flat drives. E-Z-Go 26414-G01. EZ-GO Starter Generator belt for E-Z-GO 1991 and newer, gas with 4-cycle or 295cc and 350cc engines. 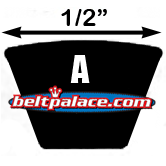 Oem Spec Belt Replaces EZ-Go belt 26414-G01, Stens 248-035 (kevlar) and 265-779 belt. BANDO Belts A33, A33KC, FHP 3L350. Stens 265-905, Stens 265-779 OEM Replacement belt. AX33 Molded Notch V-Belt. AX Series. 4L350 FHP V-Belt. Consumer Brand.